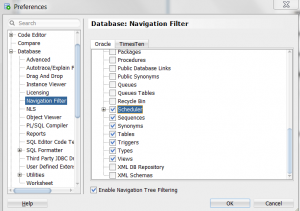 Oracle has launched the latest version of SQL Developer. Let’s check out some of the top preferences that you should tune into to enhance your experience with it. We need to write so many codes in the program. So the look and feel of the software also matters. 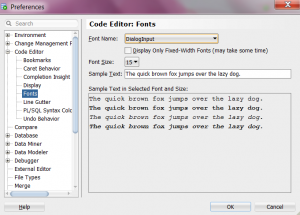 SQL Developer has introduced thousands of new fonts in this version and one of the interesting among them is Droid fonts from Google, which is mobile friendly. Just choose your favorite font and size, to have better view and experience. It’s been super easy now to save your work in the SQL. There was a time when we were allowed to save 100 statements by default. Now you can save up to 500 statements; plus the new feature of Oracle Database Cloud Service has improved the uploading experience. As quoted in Oracle’s website, you can simply copy your work on the cloud and can even monitor them. We all use SQL for different purpose and many of us use lower versions. There are times when we accidentally opted for licensed version and we wished there was a feature that helped to avoid these troublesome offers. The new version has the option for you to disable the Tuning &Diagnostic Packs. Don’t forget to look this option at the connection level itself. We always look for the options where we need to spend less time and have to move least of our limbs! The new “single click” feature of the SQL developer will open your objects with the first click. It’s interesting and fun for the new users, but can be irritating for professionals. Short cut keys are a developer’s best friend! 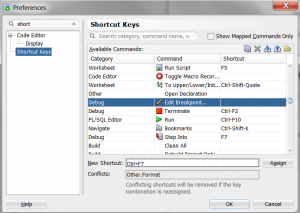 There’s one amazing feature introduced by Oracle in the SQL Developer 4.1.1 version which allows you to set shortcut keys according to your own need. You can customize it according to your own preferences! But make sure you don’t assign same for two. Just go to “Category”, find the “Other’s Category” and you’ll get the list of all the shortcuts. Most of us don’t use every feature in Oracle. So a clean and empty dashboard to work can make us feel happy, right? 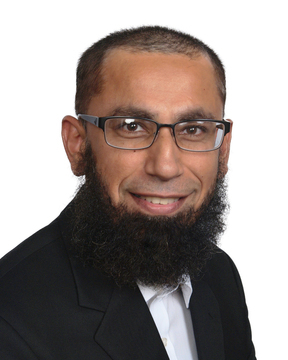 So why don’t you simply conceal database object types in connection trees you don’t want to work with? Checkmark the “Enable Navigation Tree Filtering” option and you can select the trees you want to hide. This is our favorite as it will surely prove very beneficial when debugging. Enable the “Show Query Results” feature, and you can now simply move the pointer over your query to the SQL statement being used up in it. Opening the files in the SQL Editor is troublesome. 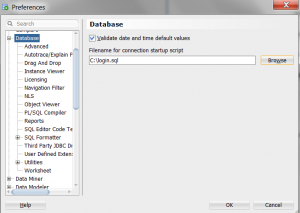 In SQL Developer we can open all our files using an External Editor? Yes, now we can. 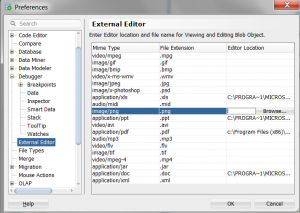 You simply need to define file type and set the path in the External Editor under the “Debugger” option. This new feature with “Step-Over” option has eased the work when in debugging mode. You can now set this option and it will stop the execution at the first line. This will allow you to run the debug session at the breakpoints. Now you can set your default global startup connection script in the database for all the groups of files in the output. 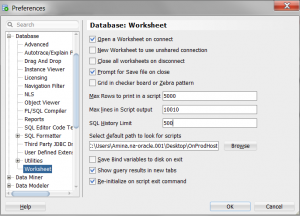 SQL Developer 4 has a Cart feature that allows database object drop and drag, as well as real time results in database comparisons and deployment script generation. Save time if you do a lot of Subversion, CVS or Git, use File History alongside Source Control to manage local file tracking. If you mouse over the Query Result labels, you access a feature that keeps query results available as you execute new ones. This is a comparison feature that lets you see different versions of your work in real time. Take into account this feature eats up memory. We hope every user looks to this list as a stepping stone. 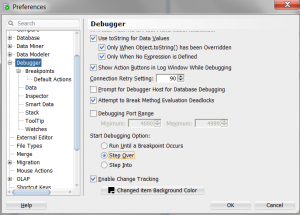 These are some tweaks that will help to enhance your experience when using SQL Developer version. Of course, there would be many other cool new features too. Just spend some time to discover them and share them with others. Thanks. It is very nice to hear from you. You have added a lot of cool features to your software. The thing that I like the most about SQLDeveloper is that it is portable. I can easily move my install anywhere and just fire it up, still retaining my custom settings, user reports, etc.. In fact I have moved most of my troubleshooting scripts into the user defined report area including some to output in graphical format (extremely helpful – no need to create CSV’s and click the different buttons). It’s especially helpful to run these reports in the different environments by just switching the database names in the drop-down for the report. Also giving it serious thought to bundle the 100+ AWR scripts that I have written as a plugin for SQL Developer for use by the Oracle Community. 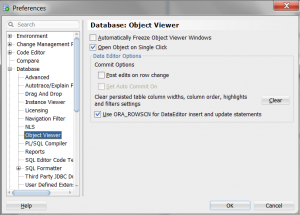 How do we view data when querying standard database view?